My first thought on writing a short article on why to make sure businesses have claimed ALL of their Facebook pages, is that the businesses that have unclaimed Facebook pages are not the ones who will ever see this post to read it. However, if my marketing tactics work out according to plan, they will decide to click on the link to this article which I will send them. 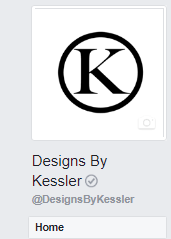 If a Facebook page is verified, it will have a circled check mark. What Are Unofficial Pages and Why Are They a Problem? Unofficial Facebook pages, or as I like to call them, unclaimed pages, are created in typically two ways. The first is from Facebook creating what it feels is a page for an actual business. Kind of like how Google makes a listing for businesses they believe are actual businesses. Both companies are trying to help all businesses out by creating a page on their platform in hopes that all businesses will claim them and put more content on them. 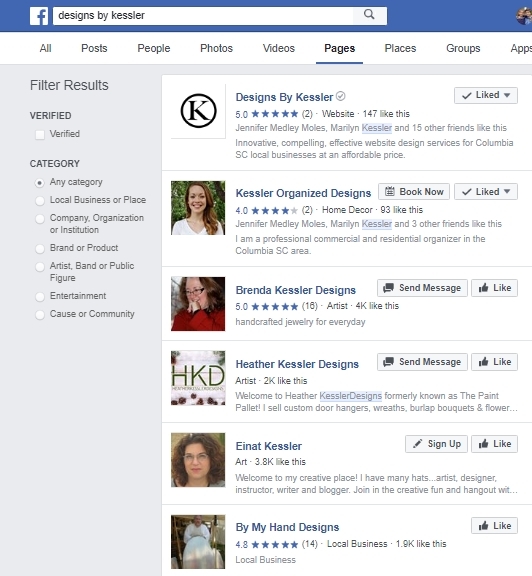 The second way that unofficial Facebook pages are created is when a user checks into a business before that user finds the official Facebook page of the business or before one has been created. When this happens, Facebook creates its own unofficial Facebook page for that person to check into. So again, Facebook is really trying to make it easy for users to connect with businesses and for businesses to have a presence for customers. The problem, though, is when these check-ins, or reviews that are left are not for positive reasons. All businesses owners know that they will not be able to satisfy every customer every time. A few highly motivated customers wishing to make sure the world knows of their bad experience can have a big impact on a business’s reputation. And, in this case, without a business even knowing these unofficial pages exist! Sure, it seems easy enough to notice that these unofficial pages have not been claimed by a business, for there are no profile or cover photos. The problem is with users being able to suggest edits to the business information and leave unmoderated reviews. Sometimes, employees create pages for a business, which may sound helpful in theory for the non-tech business owner, but it can be a messy situation if that employee becomes a not-so-happy-former-employee. Oh, this same thing can happen with other websites like Foursquare and Yelp too. So, take a few minutes once a month and do a Google search of ones business name and see what comes up. Don’t be afraid to search a few pages deep too. 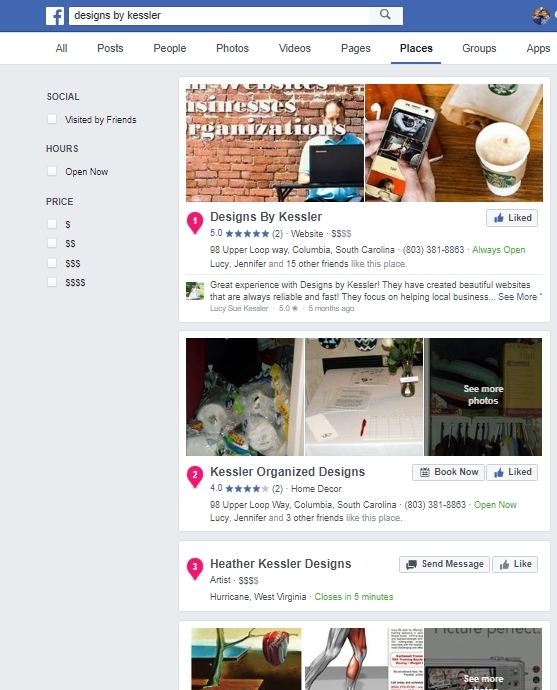 To see what page or pages are floating around on Facebook, simply do a search in Facebook of ones business name. Try different possible names if one has a business name that is longer but sometimes shortens it. 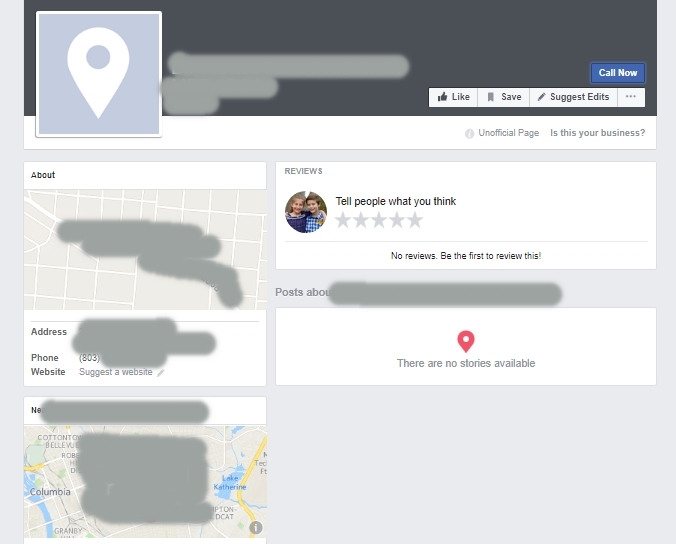 If one has not claimed the unofficial Facebook page that Facebook has graciously created for ones business, it is super easy enough to claim it. Just click on the “Is This Your Business?” and follow the steps it prompts. If there is one or more unofficial Facebook page(s) for ones business they can be either removed or merged. Both require the page to first be claimed. Once claimed it can be deleted in the settings section. Merging a page is not a difficult process we can easily assist one with. In a nut shell, the page gets claimed, then combined with a page that is already being used. Likes and check-ins will be merged with the original page too. For those without access to a page the first option is the report the page to Facebook. Click the three dots below the cover photo and select “Report Page”. A second option is to fill out a form and contact Facebook directly. They review Intellectual Property claims like trademark and copyright infringements. Here’s the link: www.facebook.com/help/contact/634636770043106. In a perfect world, a business owner could only select the reviews he or she wants to have visible. However, that is not the case. Reviews can either be turned on or off. So, if one has lots of negative reviews, it would be best to just turn them all off. If one has lots of excellent reviews on other directory or review websites, consider posting a link on Facebook to some of those reviews. A proactive way to counteract negative reviews is to work at getting a lot more positive reviews so ones overall star rating is positive. Math was not my forte in school but the higher number of overall positive ratings will diminish the power of one or a few negative ratings. Also, one is able to respond to negative reviews and should! Many times, a business owner can rectify a negative customer experience and the customer may remove the negative review. However, even if the negative is not removed, a potential customer may be impressed with the actions and resolution the business owner publicly took to correct the situation.